A sun-watching spacecraft has recorded views of an ill-fated comet plunging into the sun just after a huge solar eruption -- the second time in 10 days that a comet dive-bombed Earth's star during a solar storm. 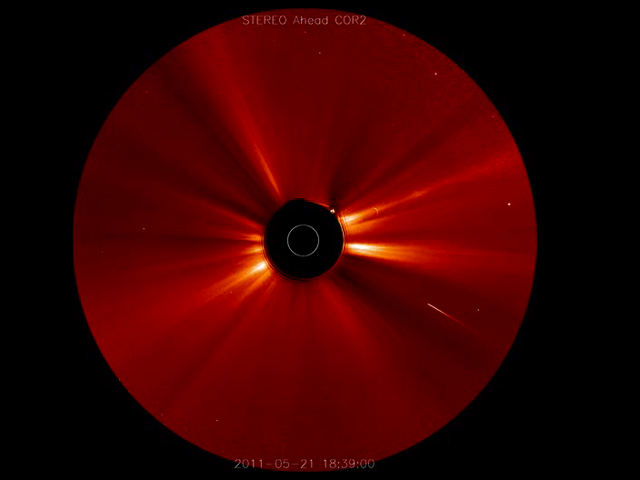 "Soon after [the eruption], as a bonus visual, a sun-grazing comet came streaking in (from the right) heading for the sun," NASA officials said in a May 27 statement. "Its tail could be seen elongating substantially as it approached the sun and apparently disintegrated." Scientists think the confluence of solar storms and suicidal comets is purely coincidental. There is no evidence of any physical connection between the two, NASA officials have said.